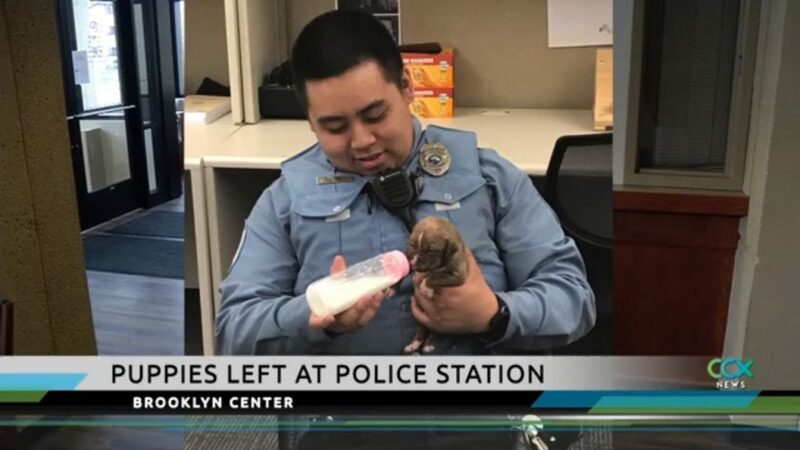 Brooklyn Center police are accustomed to criminals come through the lobby, but this weekend, something much cuter showed up. “It’s the first time I can remember an actual box of puppies just being left at our doorstep,” said Brooklyn Center Police Commander Rich Gabler. Around 2 a.m., Sunday, an officer was checking the front lobby and found a box of puppies. She took the box back into the building, and put the five fur babies in a clean basket and blanket. They were in pretty good shape, just hungry. Another officer ran to the store and picked up food and other supplies. The officers then took turn feeding milk to the little ones. Police think the bunch is about two-weeks old. Although not ideal, Brooklyn Center Police are glad the puppies were brought to the station. “if you have a pet, such as these and you don’t feel like you’re able to care for and you don’t know what to do, with, you can drop them off here, and we’ll find the appropriate resources for them. I would also research any pet adoption agencies or certainly the humane society,” said Gabler. The puppies were turned over to the Animal Humane Society in Golden Valley.